Several studies have shown the health benefits of owning pets. In fact, simply cuddling or petting an animal can reduce anxiety, lower blood pressure and heart rate, and ease depression. Animals are commonly used in therapy in hospital settings, elder living facilities, and educational settings. Now, this therapeutic modality is expanding into hospice care. The Delta Society, a nonprofit organization dedicated to improving human health through therapy and service animals, has established standards of practice for animal-assisted activities (AAA) and animal-assisted therapy (AAT). AAA are usually provided by volunteers with registered therapy animals to improve an individual’s quality of life through human-animal interaction. AAT is provided by individuals trained and credentialed in some type of clinical therapy (e.g., psychotherapy), and sessions involve client assessment, goal setting, and evaluation in addition to human-animal interaction. In AAT, the therapy animal is used to facilitate therapy goals. In the hospice setting, social workers are uniquely qualified to coordinate or deliver AAT services. “Animal-assisted programs are just beginning to be understood and offered in hospices,” says Ann R. Howie, LICSW, ACSW, founder of Human-Animal Solutions, LLC, an organization that provides consulting and therapy services based on animal-assisted interactions. According to Maureen Horgan, LICSW, ACSW, who works with her therapy dog at Providence Hospice of Seattle, in hospice settings where social workers have animal partners (usually dogs), the animals help provide socialization and supportive listening for the patients and, in some cases, assistance with symptom management. In hospices where volunteers provide AAA, a social worker is usually the point of contact to make a volunteer referral, assess the appropriateness of the referral, and provide the contact and continuity with the AAA volunteer team. At Providence Hospice of Seattle, the AAA/T program is only one year old, and the response has been so great that there are not enough qualified volunteer teams to meet the referral demands. “Any animal therapy team working with hospice patients needs hospice-specific training for the human volunteer and specialized dog/handler training to deal with the often frail patients in hospice care,” Horgan notes. Because a primary goal of hospice services is comfort care, AAA/T is an ideal option for providing comfort to patients who often feel isolated in the hospice setting. “A patient at the end of life can receive comfort from the touch of petting an animal. A patient with dementia can feel positive validation through this touch. Patients who have had animals or love animals find the visits a chance to reconnect to their positive past experiences,” explains Minaxi Patel, MSW, who works with the CarePals Pet Therapy Program at Optimal Hospice Care. Stephanie Prince, MSW, also with Optimal Hospice, says patients in hospice who have had to leave their pets behind can especially benefit from AAA/T. “Leaving their pets behind has left them lonely and depressed. When these patients see our therapy dog, they smile and the visit brings them joy and decreases feelings of loneliness.” AAA/T helps these patients deal with mourning the loss of their home and their pets, say Prince and Patel. “The therapy animal may also help a therapist establish a relationship with a patient, thus helping the patient open up and discuss issues that might otherwise have been difficult or impossible to address,” says Howie. She cites the family of a patient who made a point of telling Howie after the patient’s death how much their mother looked forward to therapy sessions with her and her dog, Lightning. They emphasized that their mother had a special connection with Howie because of Lightning and that the therapy sessions significantly improved their mother’s quality of life. Patel has also seen the positive effects of AAA/T in a patient with end-stage Parkinson’s disease who has limited range of motion. “When the therapy dog visits her, she reaches out to pet the dog, her face relaxes, and she smiles. Her range of motion increases to pet the dog, and she receives comfort and pain relief from this simple act,” Patel says. For patients with an established relationship with a therapy animal, comfort may also be provided when the patient is near death. Having the AAA/T human-animal team visit as the patient approaches death can be soothing and reduce agitation. “I was once called by a caregiver when a patient whom I had seen several times was quite agitated and near death,” Howie says. “I brought the therapy dog and carefully placed the dog on the patient’s bed. The patient stopped thrashing, sat up in bed, and petted the dog for several minutes. Then she opened her eyes and spoke quite clearly, ‘Thank you for bringing Merlin [the dog’s name].” The patient died a few hours later. Therapy animals can also be incorporated into grief support therapy, especially for children in hospice care or their siblings. Interacting with a therapy dog by giving it commands during play can enable a young patient in hospice to express feelings of grief by providing a sense of control, as well as providing memorable play time together with other family members. Therapy animals can also be a source of comfort for family members following the death of a patient and be a tool in bereavement counseling. Although the number of hospices offering AAA/T services is increasing, in some cases, the social worker’s role is limited. 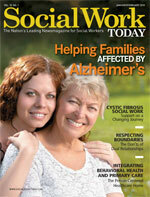 “Many hospices offer volunteer programs but do not allow a social worker to incorporate AAT into his or her services. This restriction simply limits the tools a social worker has to reach various patients. With proper training, a social worker can provide safe and effective AAT to help patients meet specific goals beyond what lay volunteers can provide in AAA visits,” Howie explains. Predisposed by their training, social workers are aware of the many dynamics that affect a hospice patient’s comfort and discomfort, including interactions with animals, says Howie. In patient assessments, the social worker can include questions about animals, learning about the role that animals may have played in the patient’s life. Patients who previously owned pets and who love animals are excellent candidates for AAA/T and can be identified during a social worker’s initial assessment. Other ways a social worker can become involved in AAA/T is by participating in orientation and training for handlers, providing supervision and support to volunteer therapy animal handlers, and leading grief support groups that incorporate therapy animals. Howie, Horgan, Patel, and Prince all related examples of ways therapy dog enhanced the quality of life for a hospice patient and even broke through barriers encountered during therapy conducted with only a human therapist. These examples included children who were uncommunicative about their conditions until interacting with a dog and antisocial elder patients with cancer who began to laugh and socialize during a therapy dog’s visit. Working with an animal partner can be rewarding and educational for the social worker, too. “There are often wonderfully special and unplanned outcomes when the social worker allows the patient and animal to lead,” says Horgan. It is expected that AAA/T will continue to grow in the hospice setting, as its benefits in comforting patients at the end of life continue to be demonstrated.